We are a husband and wife coaching team based in the island of Jersey in the British Isles. We hope that this short bio will give you some insight into who we really are and what led us to create TheLifeKey. Linda is a qualified EIF Master Trainer covering all aspects of fitness and nutrition, while Steve is certified in various therapeutic methods such as EFT, Matrix Reimprinting, NLP and PSTEC™. 30 years later, after having reached the pinnacle of her finance career and the children having left home, she decided to follow her heart and completed the intensive EIF Master trainer program becoming a fully qualified personal trainer and nutrition coach. Although Steve had always had a powerful interest in the mind and its potential he followed a career path in IT, Communications and Marketing, and it wasn’t until 2006 when he attended a course in EFT (Emotional Freedom Technique) that he really began to understand the possibilities. Having suffered a serious accident at the age of 19 he had lived with chronic pain ever since, however a single EFT session during his training eliminated the pain overnight! From that point on he spent a large amount of his spare time studying, training and working as a complimentary therapist. In 2014 we had the realisation that by combining our individual skills and passions we would be able to offer a unique service where we could help people make huge changes in their life. Transformation has to encompass the understanding that your mind and body are not separate things, and only by looking at your mental and physical health together can you really make lasting changes. Our skills as a team are ideally suited to helping you make those changes. We love what we do (so we can’t really call it work) but when we’re not “working” we will either be walking our dogs, at the gym doing CrossFit, Skiing or relaxing at our holiday home in France. 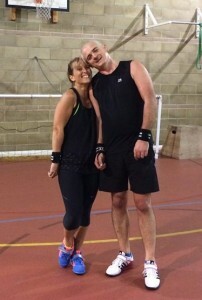 Linda is also a keen Marathon runner and Steve is a multi-instrumental musician. We’re always happy to talk about how we can help you, so please don’t hesitate to get in touch.